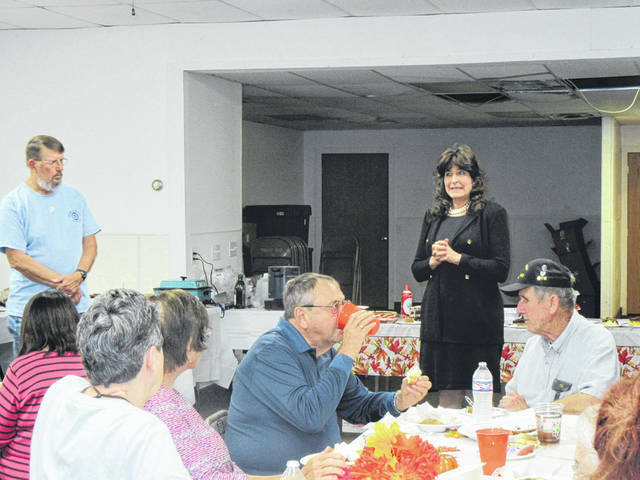 Democratic candidate for the 4th District Court of Appeals Valarie Gerlach addressed the Meigs County Democrats at their fall spaghetti dinner last week. Shawna Roberts, candidate for the 6th Congressional District, spoke to the Meigs County Democrats during the fall dinner held last week. 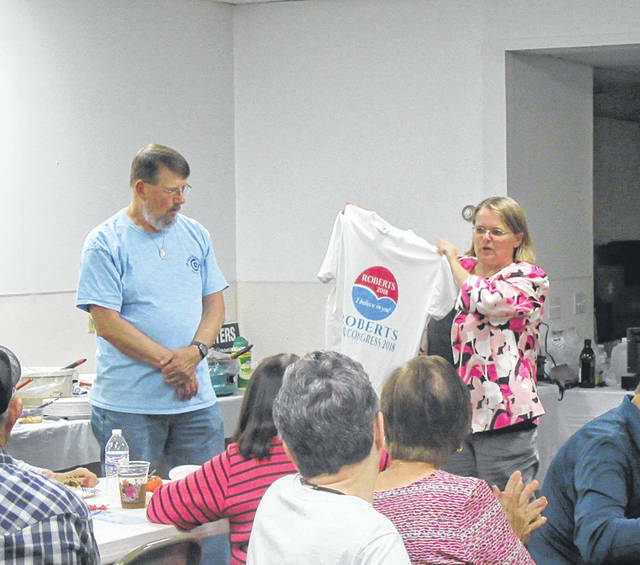 POMEROY — The Meigs County Democratic Party hosted its fall spaghetti dinner last week with guest speakers Valarie Gerlach and Shawna Roberts. Gerlach is a candidate for the 4th District Court of Appeals against Republican Mike Hess. This race is for the seat currently held by William Harsha who cannot seek reelection. The other 4th District Court of Appeals race has Democrat Marie Hoover (incumbent) against Jason P. Smith. Gerlach is from Portsmouth, and previously ran for the Court of Appeals in 2016. She explained that the Court of Appeals, for which the 4th district serves 14 counties, is the court of last resort for many people in their criminal or civil cases. The recent presence of the Supreme Court nomination in the news highlights the importance of judicial candidates, stated Gerlach. “It is an important position,” stated Gerlach. Roberts is a candidate for the 6th Congressional District against incumbent Republican Bill Johnson. Roberts, who resides in Belmont County, is the mother of five and was a small business owner for 15 years, owning a bee keeping business. She emphasized the importance of voting in the upcoming election. “Talk your friends into voting,” said Roberts. She added that there are more Democrats that Republican, but that the Democrats are harder to get to go vote. “When the people vote, the people win,” said Roberts. Meigs County resident Mike Struble encouraged fellow democrats to become involved on local boards and local positions. Struble was recently appointed to an at-large seat on the Athens-Meigs Educational Service Center board. “Consider becoming involved,” Struble told those in attendance. Likewise, Roberts encouraged the local Democrats to become involved and think about running for office. “We need to vote and need to run for office,” concluded Roberts. https://www.mydailysentinel.com/wp-content/uploads/sites/14/2018/10/web1_10.17-Democrats-1_ne2018101613619704.jpgDemocratic candidate for the 4th District Court of Appeals Valarie Gerlach addressed the Meigs County Democrats at their fall spaghetti dinner last week. https://www.mydailysentinel.com/wp-content/uploads/sites/14/2018/10/web1_10.17-Democrats-2_ne2018101613629427.jpgShawna Roberts, candidate for the 6th Congressional District, spoke to the Meigs County Democrats during the fall dinner held last week.